Many of my friends on social media have said they were nauseous after the #RNCinCL ended. In spite of having a two-day headache, I have been reading articles about the orange real estate tycoon, watching Bill Maher (whose opinions I don’t always agree with, especially his puerile views about religion), Steven Colbert, Jon Stewart, and other satirical videos, including this gem by Randy Rainbow, Ya got Trump Trouble! In an effort to stop my incessant preoccupation with the rhetoric of hatred, I’m taking this online MOOC, Whitman’s Civil War: Writing and Imaging Loss, Death, and Disaster . The course is taught by University of Iowa professors Ed Folsom and Christopher Merrill. We are reading Whitman’s war poems and some of his prose writing and responding with both discussion comments and original work. I want to write about my father’s death, the loss that is so immediate to me, but I need to connect his dying to these times we are living in: mass shootings in night clubs, elementary schools, and movie theaters, terrorist attacks overseas, the brutality of police toward Black citizens, the deaths of Anton Sterling, Philando Castile, Tamir Rice, Eric Gardner… (the list is too long), the ugly rhetoric of ignorant white supremacists, an arena full of people chanting for the imprisonment of the former Secretary of State. Whitman wrote for everyone, for all of America. He recognized himself in the fallen soldier, the nurse, the mother saying goodbye to her son. As a white woman in living the 21st century, how can I recognize myself in the bile coming from the mouths of Trump and his followers? Will I recognize myself in the bodies of Black men left to bleed on the street? To be truly honest with ourselves and to show true compassion, we have to know that we are all interconnected. There is no Us versus Them. While it comes naturally to me to empathize with the plight of many Black people, I won’t be honest until I look deeply into the hatred coming from a fairly sizable chunk of the white population. Is there any way to transcend this hatred? Poetry and art might be the bridge. 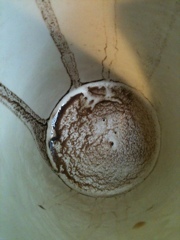 Daily coffee grounds reading: a hawk flies out of Death’s white tunnel.